In 1908, long before Singer Sewing Machine heir Robert Sterling Clark ever bought an Impressionist painting or thought of founding a museum, he led a 17-month scientific expedition to the remote reaches of northern China. Now that sojourn is bearing fruit for the institution that bears his name. 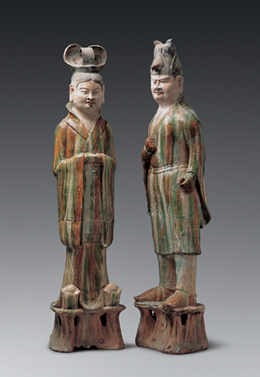 This summer, the Sterling and Francine Clark Art Institute in Williamstown, Mass., is presenting four shows about its founder and China, including "Unearthed: Recent Archaeological Discoveries From Northern China," which will display newly discovered burial objects from Shanxi and Gansu provinces, the territory Mr. Clark explored. The antiquities in "Unearthed" come from three tombs and include earthenware figures of animals and people, all borrowed from four provincial Chinese museums. There's a group of polychrome terra cotta tomb guardians—some more than 4 feet tall. The marquee piece is a fifth-century sarcophagus in the shape of a traditional Chinese house. It measures 8 feet by 12 feet, weighs 10 tons, consists of 108 pieces of stone and was found intact in 2004. "It's a small coffin, but it's very well carved," says Liu Yang, head of the Asian art department at the Minneapolis Institute of Arts. "Its details and decoration are some of the best of that period." The Clark laid the groundwork for these loans in 2008, when it commemorated Mr. Clark's trip by forging an exchange program with China's Ministry of Culture. A second show marks the 100th anniversary of the publication of "Through Shên-kan: The Account of the Clark Expedition in North China, 1908-9," which was written by Mr. Clark and naturalist Arthur deCarle Sowerby, with an exhibition of the same name. Mr. Clark, a civil engineer by training, set out with his team to collect animal specimens and ecological data, map the terrain, and take photographs of the lands, architecture, and people of the region—including the woman from Zhenyuan Xian pictured above. The team traversed nearly 2,000 miles, mostly on horse and mule, and this show will display equipment, artifacts, archival materials and natural history specimens that tell the story of that trek. Also on view will be "Then & Now: Photographs of Northern China," a small display of contemporary photographs of the region by Chinese photographer Li Ju, juxtaposed with historical photographs from the expedition. To flash forward to the present, the Clark commissioned "Phantoms of the Clark Expedition," an installation by artist Mark Dion. Using papier-mâché, Mr. Dion created sculptures of specimens, tools and materials that would have been used in 1908, and fashioned dioramas of campfires and expeditionary implements. Among the pieces are a life-size model of a boar similar to one that was captured on the Clark expedition, an oversize squirrel and a moth. Mr. Dion's piece is on view at the Explorers Club in New York until Aug. 3. The other three exhibitions, in Williamstown, open Saturday.